House of Mutt Blog » Emotional attachments … ‘extreme’ or ‘normal’?! Emotional attachments … ‘extreme’ or ‘normal’?! 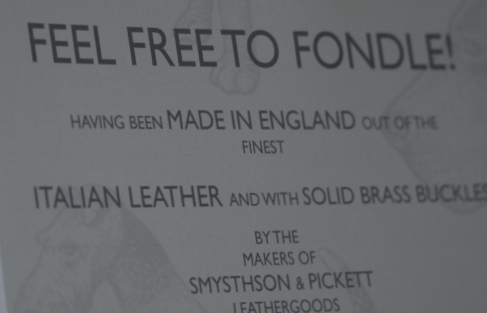 There’s now a ‘Feel Free to Fondle’ poster up in The Pet Spa – slightly surreal in the setting but we reckon it’s important that people who want to can feel the leather these collars are made of. An easily reached collar and an encouraging sign is sorting what the formal window display was previously discouraging – contact. All good stuff. But what was really really needed, I was told, was an old and battered Rex collar for people to feel, fondle, buff, stroke etc etc – much better than a new shiny one which hasn’t yet developed its patina and character. So I stood before our House of Mutt collar hooks to pick a suitable ‘character’ to go down to London and be fondled. And hit a problem. I didn’t want to let any go, I love the shine, the marks, the feel of these battered collars and felt, quite ridiculously really, an emotional bond to them that I simply didn’t have to the new ones. Mad? Maybe not – a chat last week with the lovely Julie from the Pet Spa came to mind. She’s kept all her old dogs’ collars and said she couldn’t bear the thought of ever having to buy new ones when the old carried so many memories, smells, feelings, emotions. ‘What’s needed’ she said, ‘is a collar so beautifully made that it improves with age, gathering memories as it goes – like a sort of dog family heirloom’.